Don’t Miss Super Sunday this Weekend! Don’t miss Super Sunday in Downtown West Chester this weekend! Enjoy a wide array of activities such as amusement rides, Fairman’s skate zone, moonbounces, children’s fun zone and crafts, while adults can enjoy antique cars, food, music and even mechanical bull riding. Games and mini golf will also keep all entertained at this fun and fabulous West Chester event. 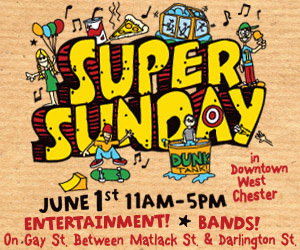 Super Sunday takes place this Sunday June 1st, from 11am to 5pm, on Gay Street between Matlack and Darlington Streets. The event is free to attend! Home of professional skateboarders, Bam Margera and Mike Maldonado, Fairman’s skate shop has been a staple of the east coast skateboarding community for over 30 years. We are lucky enough to have this great skate shop right in downtown West Chester. For more information check out their website www.fairmans.com and “Like” them on Facebook by clicking here. Yesterday was Fairman’s skate shop’s second monthly skate jam of 2012 at the West Goshen Skatepark. It was a great time and everyone had a blast! Thanks to everyone who came out as well as the sponsors, Fairman’s Skate Shop of West Chester, Spitfire, and Vitamin Water! Check out the video of the event and we hope to see you there next month! Fairman’s Skate Shop Since 1977! I have been shopping/supporting Fairman’s Skate Shop for about 10 years now and stand by it as one of the best local shops in West Chester. I remember the first time walking into Fairman’s and feeling nervous, I was very young and new to the whole skateboard scene/lifestyle at the time… Also because I was walking into a place were I knew many legendary skateboarders have worked and came out of, such as Bam Margera, Kerry Getz, and Andrew Cannon just to name a few. However, As I entered the shop I was quickly greeted by staff and they were very helpful and kind, right then and there I felt nervous no more, I felt right at home. After that first experience at Fairman’s I have been shopping and hanging out there ever since, I am now close friends with every staff and team member. I have Fairman’s to thank for growing my love and passion for skateboarding and thank them for helping me assemble my very first skateboard years ago. Next time you’re in town make sure to stop by Fairman’s located on the corner of West Gay and North Church Streets in the heart of historic downtown West Chester. Even if you do not skate, snow, or surf they offer a wide selection of apparel and shoes for everyone. Below is a short description of the shop and hours of operation… Happy shopping! Skate Jam at Providence Skate Spot! Fairman’s is hosting a skate jam at Providence skate spot that will be closing out the cool new spot for the season! Join Fairman’s at the Providence Church Skate Spot for a fun day to skate with your friends! Saturday, November 12, 2011, starting at 11:00am. FREE to skate. $10.00 to enter Best Line Contest. The spot is located at 430 Hannum Avenue, West Chester, PA 19380. For more information you can contact Fairman’s skate shop at 610-344-9959.